Could anyone like, make a video tutorial on how to add these spaceships in 0.97? that would be really helpful too! Ok, these picture show the procedure. 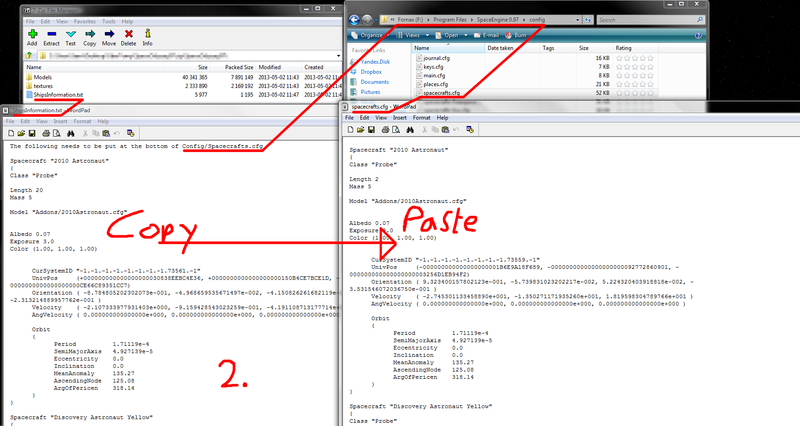 Step 2: Open the text file in the archive and copy its information into the spacecrafts.cfg file inside the config folder of your SE directory. 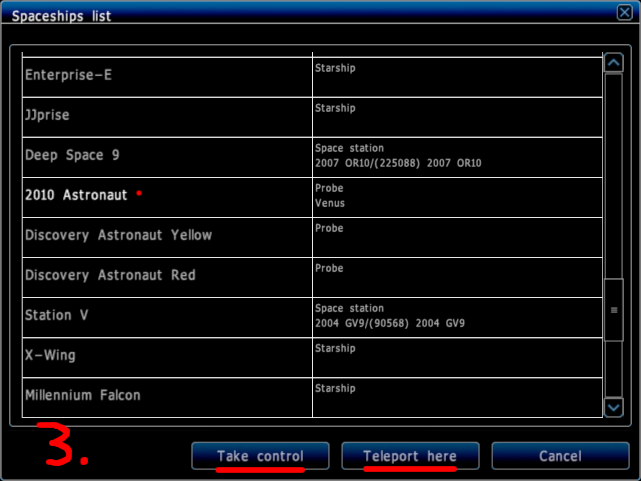 Step 3: Run SE and open the ships list (Ctrl-F3), select one of the ships you just added, and either take control of it at its current location or teleport it to you. If you do this and it doesn't work then it's never going to work. Well, that's it. I've done everything you said and it still does not work; this can only mean it lies on my computer. So I will have to accept the fact that due to unknown reasons, I will (for now) never be able to use added spacecraft - and I'll have to do it just with the default Shuttles and Starships. Thank you very much for trying to help out anyway. I hope in a later version of Space Engine, I might be to use ships. But currently that seems impossible. Oh let's just forget this! I'm certain Space Engine 0.97 has more than enough amazing features besides this. And if a new version comes out THEN it might be fixed (for me). Thanks! I'll download it tommorow and see if it works then. But, will the .sm files from this thread work in 0.96? But, will the .sm files from this thread work in 0.96? Probably not. You'll have to find ones which were released for 0.96 (there are many). Well, that's it. I tried everything now. Doesn't work in 0.96. Extra spacecrafts don't work for me and never will. End of discussion. Won't fix anything as harb said. In fact none of these will work with the patch. Just wait for the patch at this point. I just want to point out, for the sake of clarity, that it's not technically going to be a patch, but a full updated version, meaning that it won't be installed over your existing SE installation like a patch would be. Just to avoid any confusion for anyone. I have FINALLY found a solution for my problem. 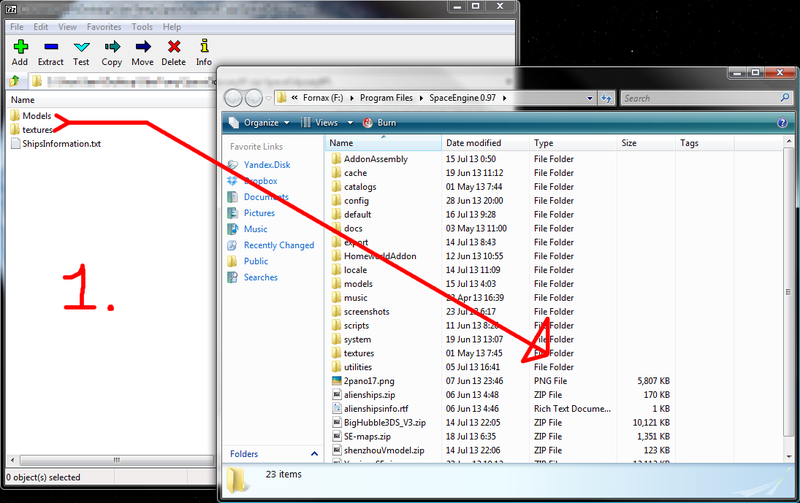 I've downloaded the files, but i've given them the same names as the default spacecraft files; which actually worked! You wouldn't believe how excited I am. By the way, after you completed all those requests, you should do the ISS! Celestia has a good ISS mesh.. Probably won't be able to do a lot of the requested ships and I won't be doing anymore ships for 97. How exactly did you convert the 3D meshes to space engine .SM? Can I know? You put them into SE as .obj files and it converts them automatically. Anyway I already posted the link to you before about how to do all of this. Trying to download Serenity and other available ships gives off major virus warnings and get blocked by my virus program. as I recently noticed, the download server no longer responding may not be because of your virus program. It would appear that u.to links are currently temporarily down. Also, can you please provide what virus program you are using? Maybe then we can help.